One thing subcompact cars lack these days is great set of features. Sure, they're less expensive as a result, but what if there was a subcompact that offered great features and a great MSRP? Too good to be true? Not anymore, thanks to the 2013 Ford Fiesta. Designers at the Blue Oval realized that affordability and convenience are not mutually exclusive items. 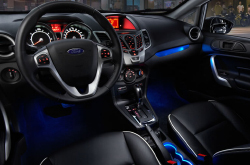 With features like heated leather seats, push-button start, fully powered accessories, SYNC and more, the 2013 Ford Fiesta is a Dallas commuter's best friend. Other great features like ambient lighting, satellite radio and heated exterior mirrors improve the level of luxury and convenience even further. It's been said that luxury and value are seldom bedfellows, but with the Fiesta they sleep side by side. Ford Fiesta buyers in Dallas can choose from three unique trim levels in sedan and hatchback form to find the model that best fits their style and budget. After reading the Ford Fiesta review below, contact Grapevine Ford for more information on the hottest little subcompact on the market that has everyone talking. What are you waiting for? Find your Fiesta now! When comparing the 2013 Ford Fiesta to the 2013 Toyota Yaris, Nissan Versa and the Honda Fit, and you'll discover that the Fiesta out does those autos in several aspects. Scan just a few of the reasons below. No aftermarket car repair sites in Grapevine, TX offer Grapevine Ford's amazing combination of certified Ford Fiesta service techs, long warranties on all services and Ford OEM parts. If you pay no attention to taking care of your Fiesta, its physical shape could be impaired, so drive it to Grapevine Ford's service center in Grapevine. We can take care of a simple task as an oil change, or deliver quality tough Ford Fiesta service and repairs like strut and shock repairs, timing belt replacements and Fiesta transmission rebuilds. Grapevine Ford is your surefire destination in Grapevine for quality, professional Ford repairs and routine maintenance. You can look up coupons day or night at the ensuing link. Did the Fiesta's combination of value, performance and features capture your attention? You just can't go wrong with its great fuel economy and interior room, either. When you put the Fiesta up against competitors like the Kia Rio, Honda Fit, Chevy Sonic and Hyundai Accent hatchback, you can't help but notice the superior design and overall quality that really sets the Fiesta apart from the "other guys." A five-star government crash test rating and a top safety score from the IIHS doesn't hurt this sporty hatchback's case for ownership, either. The bottom line is that the 2013 Ford Fiesta gives Dallas drivers a well-rounded experience that hits on all of the high points they want: features, reliability, safety, price and performance. No other compact car can claim to offer so much for so little. 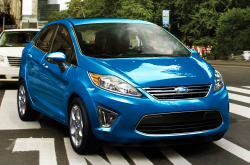 If you think the Fiesta is the car or hatch for you, contact Grapevine Ford today! One of our helpful representatives will set you up for a test drive and get you on the path to owning the exciting little car that's actually a pretty big deal. Be sure to ask about any extra amenities, features or options you'd like to see on the Fiesta; our reps are here to help find the perfect model for you.